Nowdays,large amounts of valves are commonly used in industrial construction,such as oil&gas industry,chemical industry,power genarations,ect.So many business men are involved in manufacturing and selling various valves(buttefly valves,ball valves,check valves,control valves,ect) for these industries. Here we Fly foundry are mainly engaged in supplying various casted valve components for these valve manufacturers or valve components dealers.Investment casting valve disc is one of most common components,which is applied to butterfly valve.Investment casting valve disc is opening and closing of control medium flow and circulation,playing a vital role in the whole valve structure.It could be operated by valve handle,or through equipments like turbine operation,pneumatic,electric equipment.Investment casting valve disc quality determines the overall performance of the valve. The flatness between valve disc and the rubber base will determines valve closure. 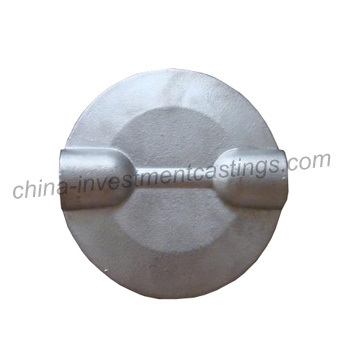 We normally manufacture investment casting valve discs with stainless steel 304 or stainless steel 316.SS304 is steel which is most widely used for stainless steel castings at present for its good ductility and prefect anti-corrosion ability.As Mo element is added in SS316,then it has good performance of reducing medium resistance and pitting corrosion resistance.Especially in water medium, whose corrosion resistant ability is better than that of SS304.